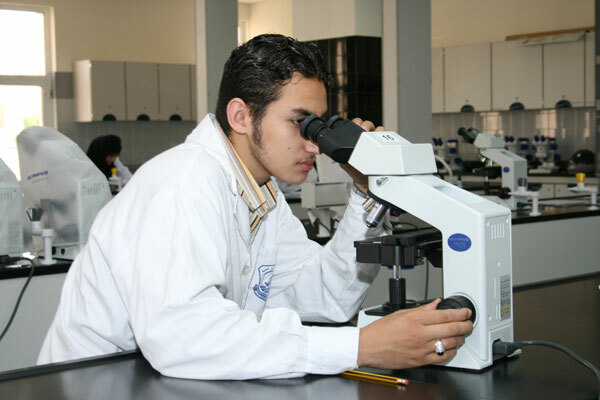 The College of Pharmacy offers a four year program leading to the Bachelor of Pharmacy degree. The college is in academic partnership with West Virginia University USA and has been approved by the Ministry of Health and the Ministry of Higher Education. Our vision is to be recognized nationally and internationally for quality education in pharmacy and research in pharmaceutical and health-related topics. The curriculum is integrated throughout. The Pharmacy Curriculum has significant focus on active student learning strategies enabling the students to be good learners while they pursue their academic program. The modules on model pharmacy, biomedical seminar and gross anatomy laboratory exercises constitute the major stream of its integrated curriculum. The program has a thrust on theoretical concepts for which a rigorous laboratory procedures are prescribed. Components on professional skills, ethics and values along with adequate provision for communication skills are embedded in the curriculum and assessment methods. Bachelor of Pharmacy Program of the College of Pharmacy, National University of Science & Technology comprises 139 credits of coursework, 6 credits of electives and 600 hours of training components. A student has to successfully complete 145 credits of coursework and 600 hours of training to graduate. To encourage the student's mindset for creativity and innovation for entrepreneurship. Apply basic knowledge and fundamental skills from chemical, biological, biomedical, phyto-chemical and behavioral sciences to develop concepts of disease, disorder and drug therapy. Correlate the physicochemical properties of drugs to their biological action and use this knowledge in the development and formulation of drug delivery. Prepare formulation of various drug dosage forms, analyse composition and assess their quality according to official guidelines/publications. Construct patient care plan based on patient history, clinical condition, medication regime and the knowledge of biochemical, microbiological, pharmacological, pharmacokinetic, therapeutics and safety profile of medication. Explain communicable and non-communicable diseases, effective methods to prevent, control and treat with due emphasis on antimicrobial and antiviral resistance. Apply pharmaceutical science knowledge to each stages of develop drug discovery, development and commercialization. Serve as an expert and a team player in the field of pharmaceutical sciences, trainer in professional development activities and in committees to develop policies and procedures required for good pharmacy, clinical, warehouse and manufacturing practices. Demonstrate written, verbal and digital communication skills required for interpersonal communication and collaborative professional activities to excel at workplace. Demonstrate practical skills in formulation of dosage forms and evaluation. Apply leadership knowledge, qualities and skills to engage in innovative activities to accomplishing professional and/or business goals. Demonstrate effective critical thinking to synthesize, integrate, and evaluate data from diverse sources into research question, ethical decisions making and in carrying out meaningful research. Demonstrate professional behaviour, display self-awareness, self-improvement and practice the profession in an ethically responsible manner. Demonstrate leadership quality, teamwork and ability to advocate health and wellness promotional activities to provide cost-effective optimal care through quality pharmaceutical care practice. The graduates of Pharmacy have a pivotal role in the healthcare system and are mostly employed as hospital pharmacists in the government and private sectors. There are also challenging job opportunities in community pharmacies, pharmaceutical marketing, and drug regulatory affairs. The Pharmacy graduates are appointed in the pharmaceutical industries as production chemists and quality control analysts. Most of the graduates pursue their higher education in specialized branches like clinical pharmacy, pharmacology, management, industrial pharmacy, biotechnology, and drug discovery to excel their career in health care sectors, research, academia and industry. The curriculum gives ample skills and knowledge to the graduates to evolve as entrepreneurs and start their own pharmaceutical businesses.